This property is strategically located just under 30 minutes from the international airport in Liberia 30 minutes from the surrenders beaches like Playas del Coco,Playa Hermosa,Four Seasons Hotels Papagayo e.t.c. 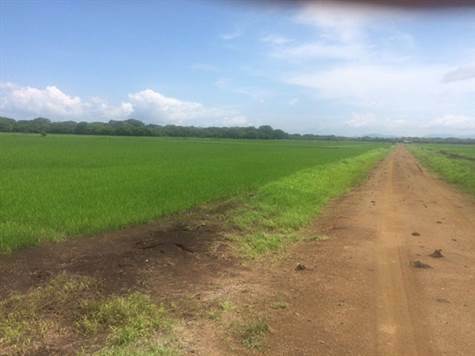 Currently used for planting Rice just harvest and preparing for sugar cane use for the next 6 year as the cycle of the sugar cane plant needs to be renewed every 6 years. And 15 km from another one representing a minimum cost on logistic when other farms travel 100+ kilometers in some cases. The farm has 3 deep wells 2 are register 1 spring water source and a permitted river concession to pump water into crops. Plenty labor workers in the area available to enjoy even lower cost on lodging and food. More land available if wanted, up to 540 Hec approximately. Rice,sugar,melon are the most planted in the area. It's call: Liga de la Caña.